One bet at a time, Robert Nehorayan battled through a 596 player field that generated an $804,600 prize pool to win Event #41: $1,500 Limit Hold'em for $173,568 and secure his first bracelet. It is Nehorayan's best live cash, with his previous greatest also coming at the WSOP when he was awarded $58,570 for 146th place in the 2007 Main Event. Over the last three days, plenty of action has taken place at the Rio All-Suite Hotel and Casino which concluded in a heads-up battle between Nehorayan and winner of the 1997 Event #1: $2,000 Limit Hold'em, Kevin Song. Song nearly missed out on winning his second bracelet 21 years after claiming his first. The final table saw players swing up and down in the chip counts, but Nehorayan was one of the constants throughout. Speaking after his win, he said "It feels pretty good. I got a little frustrated throughout the match but fortunately was I able to overcome my emotions. The cards helped too obviously." Nehorayan commended Terricita Gutierrez and spoke of his relief of getting past a player he saw as his toughest opponent. "Terri was my toughest opponent because she's a limit pro. She plays 80/160, 40/80 every single day. That's her game." Nehorayan admitted he doesn't see himself as a poker pro and even has a nickname due to his recreational nature. "People call me 'Rec Rob.' Funny thing, I was playing No-Limit Hold'em one night, I think 20/40/80 at Commerce and I called a huge bet on the river with just an ace. This kid just flipped out, and he said: How do you call with just an ace!? Another kid was like: that's Rec Rob! He's a recreational player; he can't fold an ace!" Nehorayan laughed. 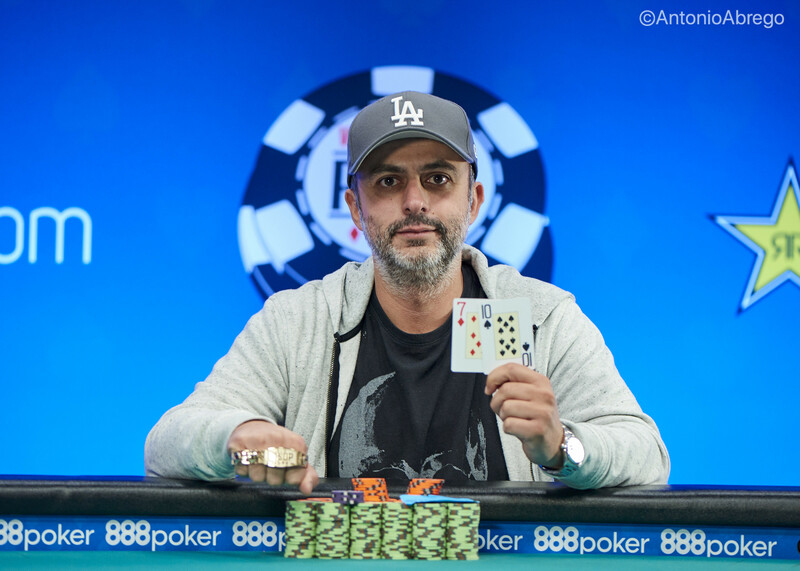 Despite his recreational nature, Nehorayan was able to defeat a wealth of experienced players who took their shot in Event #41 such as Dutch Boyd, Chris Ferguson, Daniel Negreanu, David Bach, Ari Engel, Marcel Luske and Jesse Sylvia. 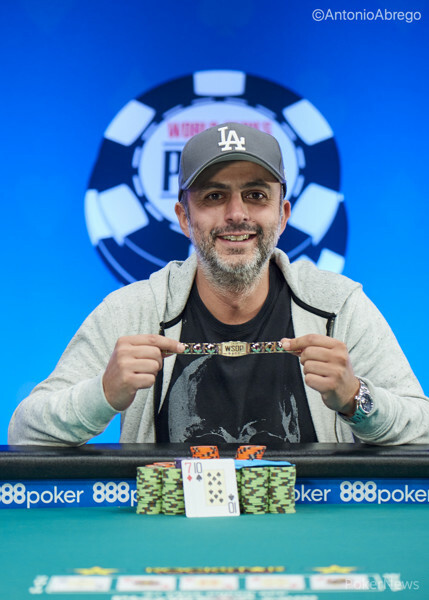 A total of 19 players returned for the third and final day who all had the goal of winning a bracelet, but for many of them, the dream didn't last long at all as seven players fell in the first 90 minutes of play. Bracelet winner Matt Grapenthien was eliminated in 12th place for $8,846, securing his second cash of the series after a fifth-place finish in the $10,000 Seven Card Stud Championship for $50,669, with Michael Lipner and Jeffrey Scheibner also fell before the official final table of nine. Start-of-day chip leader Matt Woodward was the first player to go once the final table was set after Terricita Gutierrez rivered two pair with king-queen to beat Woodward's ace-king. 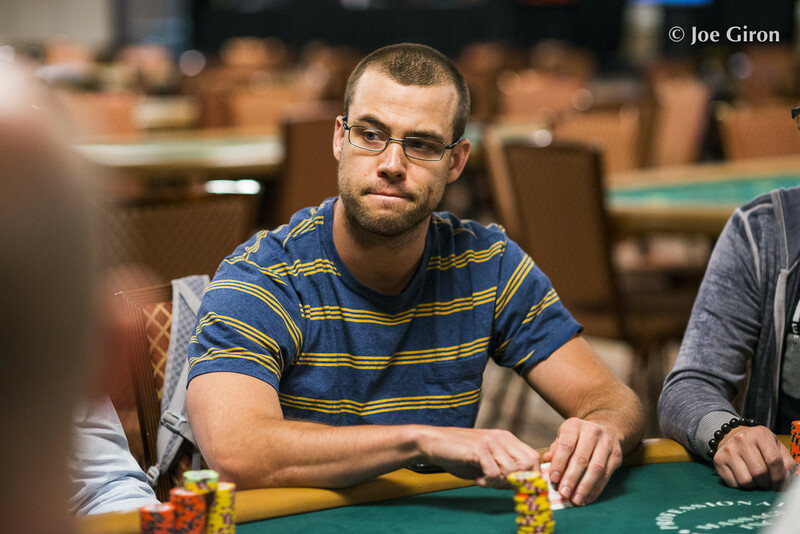 Matt Russell finished in eighth place, with Oleg Chebotarev, the only non-American player at the final table taking seventh. The action was them moved to the Brasilia Room Main Stage and at this point, Terricita Gutierrez, the final remaining lady, had built up quite a lead on her opponents. Two-time WSOP ring winner Brad Albrinck found out he would have to wait another day for a third bracelet after he was eliminated in sixth-place when Robert Nehorayan found the queen he needed with king-queen after Albrinck was all in on the turn and ahead with pocket fours. Michael Jex, who made an amazing comeback from 30,000 chips to 400,000 before the final table was set, could not write the fairytale after he was left short once more and ultimately took fifth place for $36,860. His final chips went in again Gee with four-trey against queen-ten, but there was no help in the cards. When the four remaining players returned from their dinner break, Terricita Gutierrez had nearly half of the chips in play but lost a series of big hands, which ultimately, saw her all in on the flop with ace-six-suited against Nehorayan. He took the lead when his king-queen hit on the flop and held to win the pot and send Gutierrez to the rail in fourth-place for $51,733. David Gee, who now has $201,272 in WSOP earnings, was the last player to fall before heads-up play got underway after he lost a big hand against Nehorayan when his top pair ace lost to Nehorayan's queen-six two pair. Just several hands later Gee was all in with jack-seven and went up against Song's pocket aces and Nehorayan's king-seven with the latter taking the pot with two pair to eliminate Gee in third for $73,860. 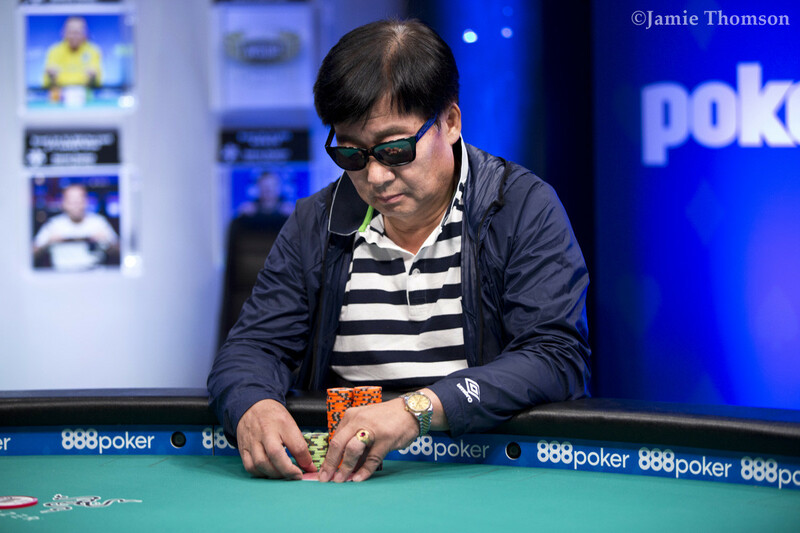 Nehorayan took more than a 3/1 chip-lead into heads-up against Kevin Song but didn't have it all his way. Song made a comeback and at one stage took the lead, but Nehorayan was able to pull it back and ultimately sent Song to the rail after his ten-seven off suit beat Song's eight-six suited when the board came two-queen-ten-four-jack. Nehorayan joined Song as a bracelet winner and takes away the $173,568 first-place prize. PokerNews will be covering every event at the 2018 World Series of Poker so be sure to check with all the updates as the most prestigious poker series in the world continues over the next three weeks. Hand #289: Robert Nehorayan called his button and Kevin Song raised. "How much have you got left?" Nehorayan asked Song. Nehorayan three-bet to put Song all-in. Song called. 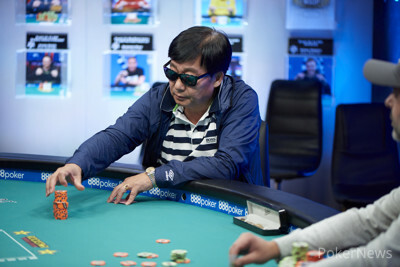 The board ran out , no help for Song as he has been eliminated in 2nd place for $107,242. 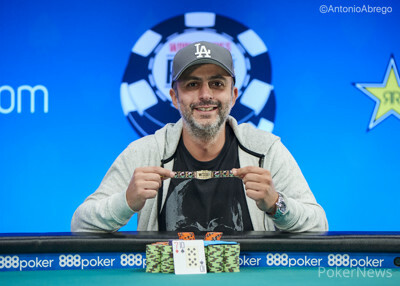 Robert Nehorayan wins his first WSOP bracelet in Event #41: $1,500 Limit Hold'em and the first place prize of $173,568! Hand #287: Robert Nehorayan raised on the button and Kevin Song called. The flop came and Song check-called Nehorayan's bet. They both checked through the on the turn and the on the river. Song showed and Nehorayan tabled to use the eight as the kicker to win the pot. Hand #288: Song folded his button, leaving himself with 205,000. Hand#281: Robert Nehorayan raised and Kevin Song called to see an flop. Song check-called a bet, and both players checked on the turn. The hit the river and Song's bet was called by Robert Nehorayan. Both players had a nine in their hand and split the pot with two pair. Hand#282: Song raised and Nehorayan called. Both players checked on the flop and again on the turn. On the river, Nehorayan check, Song bet and the former folded. Hand#283: Nehorayan raised and Song called to see a flop. Song then check-folded to a bet. Hand#284: Song raised the button, Nehorayan three-bet and was called. On the flop, Nehorayan bet, Song raised and got a call. On the , Nehorayan check-raised and Song called. The river came the and both players checked to showdown. Nehorayan revealed and won the pot. Hand#285: Nehorayan raised and Song called. The flop came , and Song led with a bet that was called. On the turn, Song bet again and got a fold. Hand#286: Song raised and Nehorayan called. On the flop of , Nehorayan check-raised before Song three-bet, and Nehorayan called. The turn came the , and Nehorayan check-called a bet. On the river, Nehorayan led with a bet and Song folded. Hand #266: Kevin Song got a walk. Hand #267: Robert Nehorayan got a walk. Hand #268: Song got another walk. Hand #269: Song raised his button and Nehorayan called. The flop came , Nehorayan check-folded to Song's bet. Hand #270: Nehorayan raised on the button and Song called. The flop came , Song check-called Nehorayan's bet. The turn brought them the , now Song bet-folded to Nehorayan's raise. Hand #271: Song raised the button and got a fold. Hand #272: Nehorayan raised his button and got a fold. Hand #273: Song raised on the button and Nehorayan raised. Song called. Song raised the flop after Nehorayan had bet. Nehorayan called. The turn was the and Nehorayan check-called Song's bet. The river completed the board with the on which they both checked. Nehorayan showed for the ace-kicker with the pair of kings on the board and that was enough to make Song muck his hand. Hand #274: Nehorayan raised the button and Song called. They both checked through the flop to the on the turn. Song bet and Nehorayan folded. Hand #275: Song raised on the button and Nehorayan called. They both checked on the flop and Nehorayan bet on the on the turn. Song folded. Hand #276: Nehorayan raised the button and Song called. Nehorayan bet the flop and Song check-called. The turn brought them the and now Song check-folded to Nehorayan's bet. Hand #259: Kevin Song raised and Robert Nehorayan called. Nehorayan check-called a bet on the flop before both players checked on the turn. On the river Nehorayan bet and Song called. Nehorayan held a straight with to take the pot. Hand #260: Song got a walk. Hand #261: Song raised and Nehorayan three-bet, which was called, and the flop came down . Nehorayan bet and Song called to see a turn. Song called a bet once more and on the river, Song raised Nehorayan's bet and got the call. Song tabled for a straight and Nehorayan mucked. Hand #262: Nehorayan raised and Song called to see a flop. Song check-called a bet, and the turn came the . Nehorayan continued after Song checked and got a fold. Hand #263: Song raised and Nehorayan called with the flop coming down . Both players checked and on the turn Nehorayan bet and Song folded. Hand #264: Nehorayan raised and Song called. The flop came , and Song check-called a bet. On the turn Song gave up and check-folded to a bet. Hand #265: Song raised and Nehorayan called to see a flop. Nehorayan check-called a bet, and the turn came the . Both players checked, and on the river, Nehorayan check-called a bet and Song revealed for a flush, which was enough to take the pot. Hand #254: Robert Nehorayan raised on the button and Kevin Song called. The flop came , Song bet and Nehorayan called. The turn brought them the , Song bet, Nehorayan raised and Song called. The river completed the board with the , Song bet and Nehorayan wasn't happy. Still, Nehorayan made the call. Song showed for the rivered straight. Hand #255: Song called on the button and then called Nehorayan's raise. The flop brought them the and Song folded to Nehorayan's continuation bet. Song walked away saying he needed to take a quick 3-minute break and Nehorayan agreed. After the three minutes had passed, the floor told the dealer to deal one hand every two minutes. Hand #256: Nehorayan raised his button and Song's hand was automatically folded. Hand #257: Song's hand on the button was automatically folded. Hand #258: Nehorayan raised on the button and Song called. The flop came with the , Song check-called Nehorayan's bet. The turn brought them the , again Song check-called Nehorayan's continuation-bet. The river completed the board with the . Song bet. "I can't believe this. I have aces here, that's the sick part." Nehorayan reluctantly called. Song showed for the rivered straight. Nehorayan mucked and paid the call into the pot. Hand 251: Robert Nehorayan received a walk. B]Hand 252: [/B] Nehorayan raised and Kevin Song called. The flop came , and Song check-called a bet. He again check-called on the turn and did the same action for the third time on the river. Nehorayan tabled for two pair and took the pot. Hand 253: Song raised and Nehorayan called. On the flop, Nehorayan check-called a bet. On the both players checked and checked again on the river. Nehorayan tabled for a pair of deuces and won the pot. $1,500 Limit Hold’em Starts at Noon and the Winner Will be Crowned Tonight!